Precious metals declined in the mid-week trading session Wednesday. Losses ranged from 0.4% for gold to 6.2% for palladium. Gold for April delivery stepped down $4.60, or 0.4%, to end at $1,310.40 an ounce on the Comex division of the New York Mercantile Exchange. The settlement was the weakest since Thursday, March 21. Gold futures ranged from a low of $1,308.10 to a high of $1,318.80. They fell 0.6% on Tuesday and advanced 0.8% on Monday, ending at their best level since Feb. 26. Silver for May delivery dropped 13.1 cents, or 0.9%, to settle at $15.298 an ounce. The close was the lowest since March 14. Silver futures traded between $15.27 and $15.48. They declined 0.9% on Tuesday and rose 1% on Monday, marking their best close since Feb. 28. July platinum slipped $3.20, or 0.4%, to $862.20 an ounce, ranging from $858.80 to $876.40. Palladium for June delivery tumbled $94.40, or 6.2%, to $1,421.50 an ounce, trading between $1,407.40 and $1,522.90. 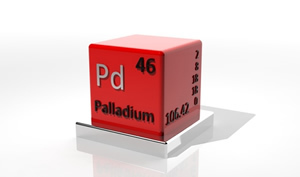 Last Wednesday, March 20, palladium scored a record settlement of $1,560.40 an ounce. "It does appear as if the palladium market is possibly seeing some selling interest from headlines touting the potential for ‘industrial rotation’ from palladium to platinum because of the recent differential of $700 between the two metals," MarketWatch quoted analysts at Zaner Metals. Gold declined $6.60, or 0.5%, to $1,309.70 an ounce. Silver fell 4 cents, or 0.3%, to $15.40 an ounce. I’m glad I didn’t buy any palladium yesterday…. I hope it keeps sinking so then I could purchase the palladium reverse proof eagle this year! Probably will go higher when the mint releases it. How sketchy!